Annapurna Base Camp (Sanctuary) trek is a moderate Plus (Reasonably demanding trekking at altitude up to 4,500 meters with trip to higher elevation and could include treks away from Villages on ill-defined mountain trails) an stunning trek through various landscape and rich culture with great Himalaya views, terraced fields, charming Gurung, Magar, Thakali villages (with their great hospitality), natural hot spring, water streams and a broad variation of flora and fauna. The trail leads you to the base camp of the 10th highest mountain in the world, Mt. Annapurna (8,091m). The Annapurna Base Camp is at an elevation of 4,130m/13,549ft, which is one of the most famous walk in the Himalayas of Nepal. The trek offers you the splendid views of Annapurna I, Fishtail (Machhapuchhre), Gangapurna,Tent Peak, Annapurna south, Hiunchuli, and many other dazzling peaks along with beautiful sunset and sunrise. Annapurna Base Camp (Sanctuary) Trekking begins upon your arrival at Tribhuwan International Airport in Kathmandu, the city of Temples, Stupas, Monasteries as well as rich Culture and long history. After having good rest in Kathmandu we start our trip to Annapurna Base Camp with mountain flight (25 min) to Pokhara, gateway to the Annapurna Base Camp, during the flight you will see the great view of the Himalayas (from right side of the airplane), lakes, villages and terrace fields. Once we land at Pokhara airport, we then take a scenic drive to Nayapul which takes about 1hr 30 minute. From Nayapul we start our hiking through Birethanti (a small village set at the foot of the Modi Khola and Burungdi Khola at around 1,130m) where we check our Annapurna Conservation Area Project (ACAP) and Trekkers' Information Management Systems (TIMS0 permit and continue our trekking. While trekking through the trail we pass Ghandruk (1,945m) (A beautiful village mostly inhabited by the Gurung community and also known as village of Gurkhas), Kimrong danda (from where will see breathtaking view of some of the most famous mountain peaks in the world including Annapurna South, Hiunchuli, Fishtail Mountain (Machhapuchhre) and Gangapurna), Kimrong Khola, Chere Danda. Annapurna Base Camp trail continues as we pass through Chhomrong (2,170 m. a beautiful village of Gurung people who treat you with great hospitality). We resume the trek down to the Chhomrong River along the Modi Khola (River), and we walk uphill to Sinuwa then Kuldighar at 2,350m from where the trek goes to Dovan via Bamboo while we see different types Rhododendron and Bamboo forest. Further we continue Himalaya Hotel 2,900m, Hinko Cave and Deurali 3,200m from where the view is different as it will be a sharp arid landscape. While the George widens, we unwaveringly ascend to Annapurna Base Camp 4,130 m (our destination) via Bagar and Machapuchere Base Camp (3,700 m.) above the sea level witnessing the magnificent close view of the majestic Fishtail (Tail of the Fish, Machhapuchhre) Mountain along with other broad Himalayas such as Annapurna-I, Gangapurna, Annapurna South, Hiunchuli and many other peaks. Also good view of sunrise and sunset over the Himalayas and Glacier. After the accomplishment of our goal of reaching Annapurna Base Camp we trek back to Chomrong (same way). The climax of the trek allows you to enjoy the relaxing bath at the natural hot spring in Jhinudanda. The journey continues as we trek to Nayapul via New Bridge, Kliu, Shauli Bazaar, Birenthanti from where we drive to Pokhara where we spend a night. Pokhara is a city known as the "City of Lakes and Natural Beauty", where you enjoy your time boating in Phewa Lake, walking around the market (Shopping) or go to the bar (Restaurants) just before you fly back to Kathmandu. After the memorable time in the Himalayas, you enjoy your last Night in Kathmandu. You will be transferred to the airport according to your flight time. You will fly back home with lots of good memories that last lifetime. "Namaste" ! Day 01: Arrival In Kathmandu - [1,338 m]: Upon your arrival, a representative from Wild Guanabana will be waiting outside the airport gates to take you to the hotel. Depending on time of arrival, plans will be made for a briefing meeting once you have settled in. Day 02: Fly to Pokhara [970 m] Drive to Nayapul then trek to Ghandruk [1,945 m] - (B,L,D): After very early breakfast we transfer to the domestic airport then we take flight to Pokhara (about 25 M), the beautiful lake city and catch great views of the Himalayas from the right side of our airplane. After landing in the Pokhara airport we drive to Naya Pull (1 hour and 20 minutes) and start the trek. From Birethanti, we trek to Ghandruk, a beautiful village mostly inhabited by the Gurung community. If time permits, we also visit the Gurung museum today. Overnight in Ghandruk. Walking hour 5-6 hours. Day 03: Ghandruk to Chhomrong [2,170 m] - (B,L,D): At this juncture, we climb up for around an hour up to Kimrungdanda. On the way, we can enjoy great views of Annapurna South, Hiunchuli, Fishtail Mountain (Machhapuchhre) and Ganggapurna. Next, it’s a steep descent takes us to the Kimrong Khola. After another steep ascent from Kimrong Khola to Chere Danda, we descend for a while then it’s a gentle walk to Chhomrong. Chhomrong is a beautiful village located on the lap of the giant Annapurna massive. Overnight in Chhomrong. Walking hour 5-6 hours. Day 04: Chhomrong Trek to Deurali [3230 m] - (B,L,D): Leaving Chhomrong the trail descends to cross the Chhomrong Khola on a suspension bridge, then climbs high above the Modi Khola on it's west bank. The trail then ascends through the villages of Tilche and Sinuwa and finally reaches Kuldi at 2350m. From here the trail descends a long, steep stone staircase into bamboo and rhododendron forests and eventually we reach the small settlement of Bamboo Lodge at 2340m. After lunch at bamboo The trail continues along the west bank of the Modi Khola valley through dense bamboo forest, occasionally dropping to cross tributary streams, but ascending continuously, and reaches the settlement of Doban at 2630m where there are several good lodges. The trail then continues high above the river to our resting place for the night, the small settlement of tea-houses known as Himalayan Hotel at 2900m. From here it is an hour's walk to Hinko Cave at 3160m, and a further half an hour to Deorali at 3,230m. Tea House. "B,L,D" (Trek) (Walking time 7-8 hours). Day 05: Trek to Annapurna Base camp [4130 m] - (B,L,D): Above Deorali the valley widens and becomes less steep. Reaching Deorali brings a feeling to us that we are near to our destination. We can now see the 'gates' to the Sanctuary. The trail continues into the Sanctuary to meet the Modi Khola and follows the river to Bagar, a meadow at 3310m. From Bagar we continue to trek upwards and reach the area known as Machhapuchhre Base Camp at 3720m where we will have a lunch. This is a collection of tea-houses spread over a large area. From here the mountain views are fantastic and include Annapurna (8091m). After Lunch at Machhapuchere Base Camp we start our trek and make the 2 hours trek to Annapurna Base Camp at 4095m, crossing four hotels on a knoll at 4130m. The trail continues upwards, on a good path, to the south of the moraine This is the highlight of the trip and affords us marvelous close up views of the mountains that make up this incredible natural amphitheatre. On arrival at ABC we get a superb view of the near vertical south face of Annapurna that towers above the Sanctuary to the north-west, which was climbed in 1970 by Don Whillans and Dougal Haston on an expedition led by Chris Bonington. We arrive at ABC mid-morning which allows ample time to explore the surrounding area and take some stunning photographs. 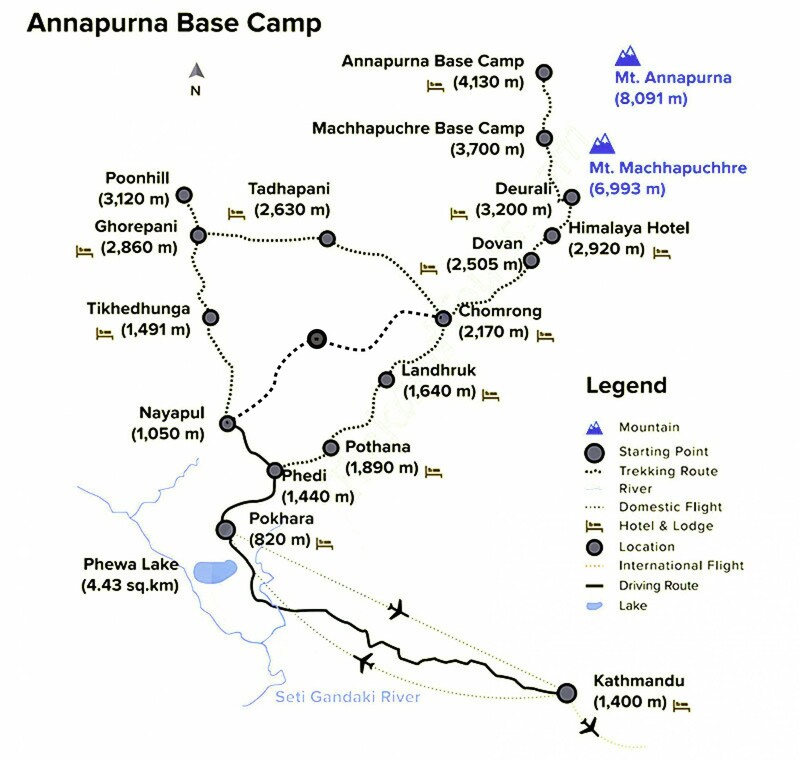 Overnight stay at Annapurna Base Camp. Tea House. (Trek) (Walking time 6-7 hours). Day 06: Annapurna Base Camp to Bamboo [2,310 m] - (B,L,D): From the Annapurna base camp we retrace our steps to Bamboo. Today’s trek is downhill so it shouldn’t be very difficult. Besides, we will always have the company of the extraordinary landscape to cheer us up. Overnight in Bamboo. Walking hour 7-8 hours. Day 07: Bamboo to Jhinu Danda [1,760 m] - (B,L,D): From Bamboo, it is an uphill trek to Kuldighar followed by a downhill walk to Chhomrong Khola. Then we climb the stone steps to Chhomrong. The trail then descends to Jhinu Danda, where we will be resting for the night. Today we will have an opportunity to enjoy hot springs just 15-20 minute downhill walk from Jhinu Danda to soothe our aching body. Overnight in Jhinu Danda. Walking hour 5-6 hours. Day 08: Trek to Naya Pul then drive to Pokhara [980 m] - (B,L): On our way to Naya Pul from Jhinu Danda we get to enjoy the amazing hill landscape of western Nepal. From via Shauli Bazaar at 1,140m. Once there, it’s an easy and pleasant walk along the Modi Khola riverbank to Birethanti at 1,065m, where we stop for lunch. Birethanti is a beautiful riverside village that is usually busy with many trekkers starting and finishing their treks. From here we trek to Nayapul then catch a car back to Pokhara. The evening is free to relax and catch up on some last minute shopping. Day 09: Fly to Kathmandu [1,330 m] - (B): After breakfast in Pokhara, we have a mountain flight to Kathmandu; it is a thrilling exciting flight over forests, fields and villages with the Himalayas at the background. On arrival, we transfer to the hotel. The remainder of the day is at leisure. Day 10: Fly back home (1,330m) - (B): We will transfer you to the airport and assist with check-in procedures. Accommodation in Kathmandu and Pokhara with breakfast. Meals as stated above (B=Breakfast, L=Lunch & D=Dinner). Accommodation in Tea houses during the trekking (Double Room Basis). Kathmandu Pokhara Kathmandu flights with airport Tax. Pokhara Nayapul Pokhara Transfer by Car. Trekking Porter with insurance. (01 Porte for 2 pax carries about 22 KG). Trekking Permits and National Park fees. We offer trekking in Nepal from September to Mid June. However within this period there are clear seasons in the weather. From early September the monsoon rains decrease. By October through to December the weather is usually stable with mild to warm days, cold nights and clear views. Daytime temperatures can reach 25-30 deg C at low altitude in October and nights can drop to below 0 deg C at higher altitudes. Winter trekking, from December to February, offers cool to mild and clear days with often very cold nights. Daytime temperatures at low altitudes will be mild, around 20 deg C and at night may drop to 0 or as low as -10 deg C at the higher points. Occasionally winter storms can bring snow as low as 2500m. In March the cold, dry winter season begins to give way to warmer, wetter spring conditions. Mornings are usually clear with cloud build-up occasionally bringing afternoon rainstorms. Daytime temperatures increase quickly in March, with temperatures of up to 30 deg C and mild nights at low altitudes. The increase in rainfall in the hills is more than compensated for by the spectacular displays of rhododendrons and other wildflowers at this time of year. Late spring conditions, as in April and May, are generally hot at low elevations and as the clouds build up to the next monsoon, daily afternoon rainstorms are common. This is a period that generally has clear weather at the higher altitudes and is traditionally a time when mountaineering expeditions commence their ascents. The monsoon creates a rainy season in Nepal, which lasts from mid-June to Early -September. During this time the Nepal Himalaya is unsuitable for trekking, with the exception of a few remote valleys. We offer treks during this period in Low altitude Treks in the Nepal Himalaya, Tibet & India (Kulu, Ladakh). The post-monsoon period: From early September the monsoon rain starts to decrease. By mid-October through to mid-December the weather is usually stable with mild to warm days, cold nights and clear views. Daytime temperatures can reach 25-30 degrees Celsius at lower altitudes and decrease as you gain height. Over 3000 meters the daytime temperatures can vary as much as 10 to 20 degrees Celsius, and may be hotter or colder, depending on whether it is sunny or windy etc. At night at lower altitudes, temperatures do not normally drop much, although as you approach November it does get colder and the days shorter. Up high it can drop sharply at night, from 0 to minus 10 or 15 and more when camped on the ice or snow. The pre-monsoon period: In March the cold, dry winter season begins to give way to warmer, wetter spring conditions. Mornings are usually clear with cloud build-up bringing occasional afternoon rainstorms. Views of the mountains in the middle of the day and afternoon may often be obscured. Daytime temperatures increase quickly in March with temperatures of up to 30 degrees Celsius and mild nights. At higher altitudes it is similar to the conditions of the post-monsoon period, however there is usually more snow, which has accumulated over the winter period. There are spectacular displays of rhododendrons and wildflowers at this time of year. Late spring conditions ie April and May, are generally hot at low elevations and as the clouds build up to the next monsoon, daily afternoon rainstorms are common. Lightweight Trekking (walking) (Waterproof) boots and spare laces. If new one is being bought, “walk then in” to avoid blisters. Also bring spare laces. A pair of track shoes for evening and walk around campsite. Warm Jackets (Fiber fill or down) down should be adequate. Woolen shirts and thick sweaters. A pair of lightweight/heavyweight trousers. Jeans are unsuitable to wear on treks. Few pairs of cotton T-shirts. At least 1 lightweight long sleeved shirt is particularly to avoid sun born. A woolen hat for morning and evening and Sun cap (Hat) during the day and ensure it has a wide brim to cover the face and neck..
A pair of sandals to shower and campsite. Few pair of thin and thick woolen socks. Underwear: normal quantity and swimming costume. 2-5 large plastic bags to separate clean and dirty clothes. Some small plastic bags for garbage. Toiletries with large and small towels. Toilet paper can be by in Kathmandu and some villages in the mountains. Wallet or money belt with compartment for coins. Headlamp or torch light with spare batteries and bulbs.Candles or lighter to burn toilet paper and to lit on. Snow gaiters essential during winter and High Altitude trekking. Walking poles. (If you like to have). First aid kit with enough Personal medicine. It is important that your body is adequately prepared for the physical challenges of trekking. It is thus important that you assess your own condition and train accordingly. In general, the fitter you are, the easier it will be for you to handle the rigors of the trek. A well-rounded training program would include strength training, aerobic cross training, and hiking (ideally at high altitude but not necessary). Mental preparation is often overlooked. You should always keep a positive state of mind, but not ignore the signals your body sends you. Your mental stamina will, without a doubt, make the most difficult parts of the trekachievable. We will keep the packing list update asnew equipment becomes available. If you have reviews or suggestions please send us an email. Trekking in Nepal need not be considered risky affair as far as your health is concerned. Nevertheless, preventive measures such as a through medical checkup and inoculations before you start trekking can save you from unexpected hazards. Since the remote places of Nepal are not supplied with necessities that are essential for modern medical facilities and as the rescue and evacuation are measured in days, it is imperative to make a comprehensive first aid box consisting of basic drugs and accessories as part of the paraphernalia for trekking. Modern dentistry is unknown in the hill of Nepal so it is advised to have a checkup before departure from home. Tooth fillings; sometimes loosen in cold temperatures and high altitudes, so it is recommended to have them checked. Travelers are requested to bring medicine prescribed by their doctor at home. Common medicine for stomach problems, headache, and malaria is available in Kathmandu. Medicine is usually not available in remote areas. So necessary medicine is advisable to carry with you. Before going to Nepal, it is advised to get injections against typhoid, meningitis and hepatitis. This is often known as Acute Mountain Sickness (AMS), which is particularly a matter of important medical consideration while trekking in the Himalayas. Altitude Sickness means the effect of altitude on those who ascend too rapidly to elevations above 3000 meters. Early mountain sickness will manifest itself in headache, nausea, shortness of breath, fatigue; etc can be encountered as initials of the sickness. The major information source on prevention and treatment of the sickness is Himalayan Rescue Association (HRA) and Adventure Treks Nepal (P). Ltd. is the confide life member of it. We assure every trekker that all our guides have followed the training conducted by HRA with the understated information. TEST - Tandem walking test, Heel to toe step fall off from the line. 1. Find out the main problem i.e. at altitude. Assume all problems are Altitude Sickness unless proven otherwise. 2. If it is an altitude problem with mild symptoms, stay at the same altitude until the symptoms are completely gone. Take an Aspirin tablet, try to go up but listen to your body. If symptoms are worsening, go down. 1. Acclimatization: - After a 1000m. Ascent, stay one more night for acclimatization. 2. Do not make RAPID ASCENT; don't go too fast too high. 3. No alcohol, sleeping pills and smoking. 4. Drink more fluid 3-4ltrs a day… clean, boiled or treated water/tea/coffee/soup/juice etc. 5. Do not carry heavy packs. 6. Climb higher sleep lower. 7. Do not travel alone. 1. DESCENT is the best medicine; do not wait for the Helicopter. b. Diamox…for AMS 125mg. Before dinner, for sleeping problem if feeling suffocated. b. If you have mild symptoms, do not go higher. Take Aspirin. c. If you have worsening symptoms, go down. d. Do not leave your team member behind unattended, either trekker or porter. c. Get all information about Altitude Sickness before your trekking tour that will make you confident to make your tour successful. Our advice: Drink 3-4ltr of water minimum a day, don't exhaust yourself so much and breathe deep and take rest more than usual. Please fill this form and submit it for your instant inquiry. We will get back to you as soon as possible. (Hotel Pushker second Floor) Near by Big Belly Restaurant. © Adventure Treks Nepal 2001-2018.